Electric grids are far more complicated than you might expect - they require lots of stations and equipment to ensure that electricity is routed from the generating plant to your home. Denmark is currently upgrading its grid, and they're giving some of their routing stations a serious aesthetic boost in the process. Danish energy company Energinet tasked C.F. 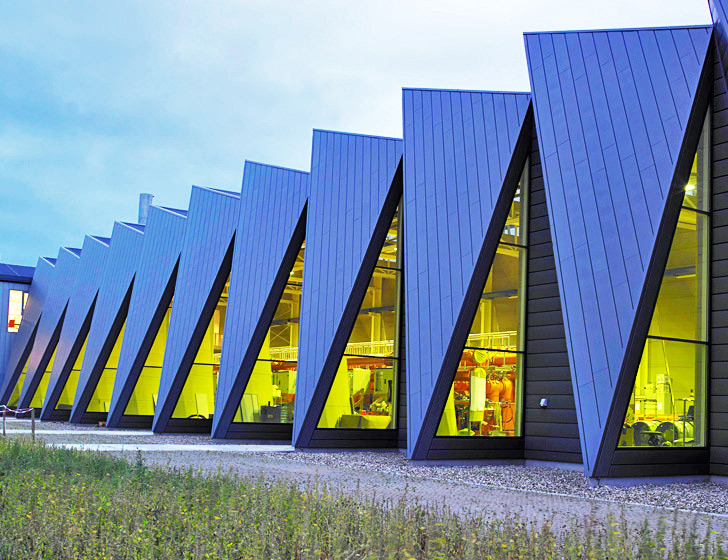 Møller to design a flexible, prefabricated station to direct renewable energy from wind turbines to other parts of the country. The new design is made from low-maintenance prefab panels, and its interior is flooded with natural light. Denmark is currently upgrading its electric grid to accommodate an increase in demand. This involves adding new power plants and improving reliability, and Energinet wants to improve the look of some of their stations and upgrade them for future flexibility. C.F. 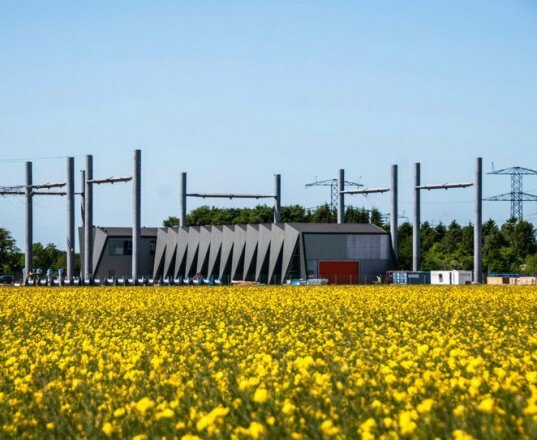 Møller’s design for the new gas-insulated switchgear station (GIS station) in Vejen, Jutland will transport renewable energy from a nearby wind farm to a new 400 kW high voltage cable that runs from Kassø in Southern Jutland to Tjele in central Jutland. The station is made from prefabricated zinc panels that are arranged to create a slanted roof and a folded exterior surface. The result is a lightweight structure with “gills” that work to let daylight inside. The strong, sculptural design changes in appearance throughout the day as the sun creates a play of shadows and light. Energy-efficient design and insulating windows minimize energy losses and improve working conditions inside. The overall program will serve as a model for the construction of future switchgear stations around the country. Denmark is currently upgrading its electric grid to accommodate an increase in demand. This involves adding new power plants and improving reliability, and Energinet wants to improve the look of some of their stations and upgrade them for future flexibility. C.F. Møller's design for the new gas-insulated switchgear station (GIS station) in Vejen, Jutland will transport renewable energy from a nearby wind farm to a new 400 kW high voltage cable that runs from Kassø in Southern Jutland to Tjele in central Jutland. The station is made from prefabricated zinc panels that are arranged to create a slanted roof and a folded exterior surface. The result is a lightweight structure with "gills" that work to let daylight inside. The strong, sculptural design changes in appearance throughout the day as the sun creates a play of shadows and light. Energy-efficient design and insulating windows minimize energy losses and improve working conditions inside. The overall program will be used in the construction of future switchgear stations around the country. The building is 1650 m² with 450 m² workshops and 1200 m² GIS building. The station is the first of many that will be constructed in Denmark. Evolution of the station's design. Cross section of switchgear station.